To participate in IDTC agility classes, dogs must have sufficient prior training to be under control in an agility setting. Usually, this means that the dog has completed the CGC class, but exceptions can be made at the discretion of the Training Director. In any given session, only one or two of these classes will be offered; check the main Classes page to see which ones are currently available. To register, fill out the agility application form and mail it in to the address given on the form, with the fee. For dogs with no prior agility training. Prerequisite: a basic understanding of basic obedience commands -- come, sit, down, stay. Ability to perform basic obedience commands in an agility environment. Ability to negotiate a short series of low jumps; familiarity with broad jumps and tire jumps. Dog will go away from handler on command (handler may use a target or toss a toy). Dog can work on both sides of handler. Ability to negotiate contact obstacles set at low height, with assistance if needed. Introduction to six weave poles. 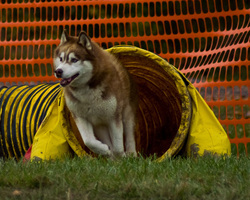 Basic knowledge of AKC agility rules, and some familiarity with various agility venues. Ability to navigate a straight open tunnel and a full-length chute. Chute may be held open. Prerequisite: completion of Agility 1, or equivalent training. Skills learned in Agility 1 are refined and polished. 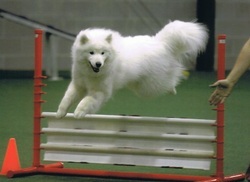 Ability to perform a sequence of up to five obstacles, including jumps and contacts, off lead. Use of two-pole exercises, e. g., figure 8 pattern, as a prelude to learning crosses. Ability to send dog ahead to a tunnel or table. Ability to navigate a curved tunnel. Prerequisite: completion of Agility 2, or equivalent training. Skills learned in Agility 2 are refined and polished, including contact zone behavior. Ability to perform a sequence of up to 12 obstacles, including all the types of obstacles seen in novice agility. Work is off lead and sequences may include some changes of direction or other challenges appropriate for novice. Introduction of crosses, starting with the front cross and progressing to the rear cross. Crosses will be used with jumps and tunnels. Ability to perform jumps and contacts at full height. Improved weaving skills, working up to 12 poles. Agility League is offered in the winter session. This is an opportunity for people to practice agility in a competitive, but fun and relaxed atmosphere. Participants work in teams of four made up of both novice and experienced dogs. Two agility courses are run each week -- one standard course and one "games" course. Teams compete for a prize that is awarded based on the cumulative scores earned during the session.